Solitons are localized wave disturbances that propagate without changing shape or spreading out. This remarkable effect depends on a self-attraction created by the medium the solitons propagate in. If the self-attraction increases with the size of the wave amplitude, solitons with larger amplitude are “squeezed” harder to keep them from spreading out, while smaller amplitude, broader solitons require a gentler squeeze. Solitons have been observed in a variety of wave phenomena, including pulses of light traveling in optical fibers, ocean waves, and in many other diverse phenomena, perhaps even in the collective oscillations of protein and DNA molecules. The largest known soliton-like object is the Great Red Spot on Jupiter. We study matter-wave solitons, which are much rarer. Quantum mechanics tells us that matter can exhibit wave-like or particle-like behavior, depending on the circumstances. 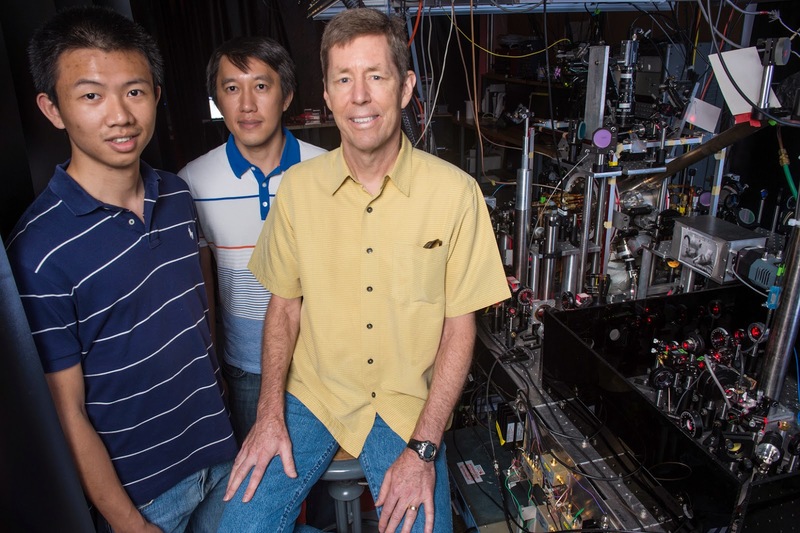 Perhaps the most exotic are collective matter waves known as Bose-Einstein condensates consisting of millions of atoms cooled to near absolute zero temperature, where the atoms act in unison and behave as if they had a common purpose. These Bose-Einstein condensates are matter-wave solitons when the interactions between atoms in the condensate are attractive, and when they are confined in a one-dimensional guide. Early experiments studying matter-wave solitons examined properties of single solitons  and soliton trains . In our experiment, originally published in Nature Physics , we create two nearly identical matter-wave solitons consisting of approximately 28000 lithium atoms per soliton. They are separated by 26 micrometers using a cylindrically focused laser beam, which acts as a barrier, and are held at opposite sides of a one-dimensional guide formed by an infrared laser beam. The guide is curved along its axis, forming a bowl-shaped potential, so that when we turn the barrier off, the solitons fall inward and collide multiple times as they oscillate back and forth. A defining property of ideal solitons is that they pass through one another without changing their shape, amplitude, or velocity [4,5,6]. Yet, when we did the experiment, we observed violent collisions that produced interference minima and maxima in the collision region. We found the character of the collision and the interference depended on a property of a wave known as its “phase”, in agreement with the general theory of solitons. In the case that the solitons were nearly in-phase, they appear to merge during the collision and then pass through one another. When solitons were nearly out-of-phase, however, we were faced with the contradiction that solitons appeared to closely approach each other, but then to bounce off each other. Figure 1: (a) Time evolution showing a full period of oscillation (τ=32 ms) for the case when the solitons are nearly in-phase. At the 1/4 and 3/4 points the solitons appear to merge and afterwards pass through one another. (b) Similar to (a) except for the case when the solitons are nearly out-of-phase. At the 1/4 and 3/4 points the solitons appear to be separated by a small gap, after which they appear to bounce off each other. 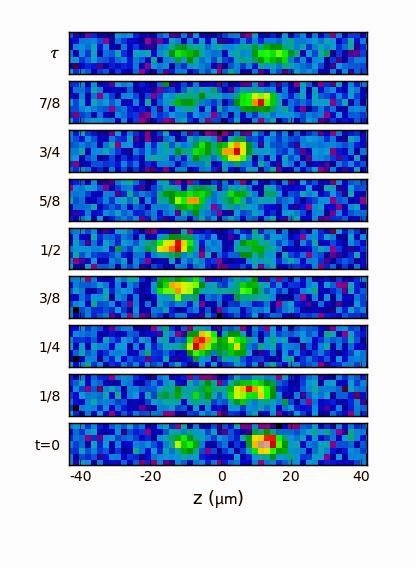 Since all solitons are expected to pass through one another, not just the ones with the “correct” phase, we did an experiment with “tagged” solitons: one soliton was made smaller to distinguish it from the other. Upon repeating the experiment, we discovered that even the out-of-phase solitons passed through one another. The interference at the point of collision had created a node, or empty space between solitons that only created the appearance of reflection. Figure 2: Time evolution showing a full period of oscillation (τ=32 ms) with tagged solitons that are nearly out of phase. At the 1/4 and 3/4 points the solitons maintain a minimum gap between them during the collision, however afterwards we observe that the solitons pass through one another as they did in the nearly in-phase case. Since solitons depend on self-attraction, they can collapse into high density compact objects when their density becomes too large. By controlling the strength of the interaction, we observed that in-phase soliton collisions can result in collapse, as the increasing density during collision causes their self-attraction to be overwhelming. In addition to the two solitons annihilating each other in this way, we also observed that a pair of solitons may merge into a single, smaller soliton. Although independent solitons have been well-understood for some time, their interaction has brought new insights. In the future, we will explore how solitons can be made into an interferometer, much like a matter-wave version of a laser gyro. To do this, we will use a sheet of light as a beam-splitter for solitons, where solitons have a quantum mechanical probability to be reflected or transmitted, each taking separate paths around a closed loop. L. Khaykovich, F. Schreck, G. Ferrari, T. Bourdel, J. Cubizolles, L. D. Carr, Y. Castin, C. Salomon, “Formation of a matter-wave bright soliton”, Science, 296, 1290-1293 (2002). Abstract. 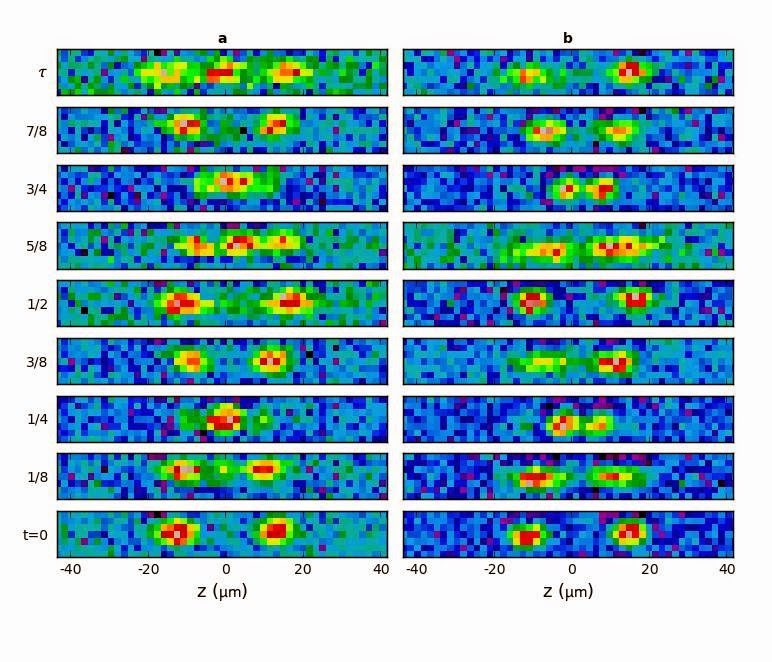 Kevin E. Strecker, Guthrie B. Partridge, Andrew G. Truscott, Randall G. Hulet, “Formation and propagation of matter-wave soliton trains”, Nature, 417, 150-153 (2002). Abstract. Jason H. V. Nguyen, Paul Dyke, De Luo, Boris A. Malomed, Randall G. Hulet, “Collisions of matter-wave solitons”, Nature Physics, 10, 918-922 (2014). Abstract. N.J. Zabusky & M.D. Kruskal. “Interaction of ‘solitons’ in a collisionless plasma and the recurrence of initial states”, Physical Review Letters, 15, 240 (1965). Abstract. V.E. Zakharov, A.B. Shabat, “Exact theory of two-dimensional self-focusing and one-dimensional self-modulation of waves in nonlinear media”, Soviet Physics JETP, 34, 62 (1972). Full Article. G.L. Lamb, “Elements of soliton theory”, New York, Wiley (1980).